Fishing Report May 31, 2011 Jeff Sundin Memorial Day weekend is behind us now and by this time next week, just about everyone will be out of school and the the O-Fish-All summer fishing season will be here. With fishing patterns stalled in the cool water, springtime mode, timing for vacations that start next week could turn out to be perfect for Walleyes, Crappie and Sunfish. 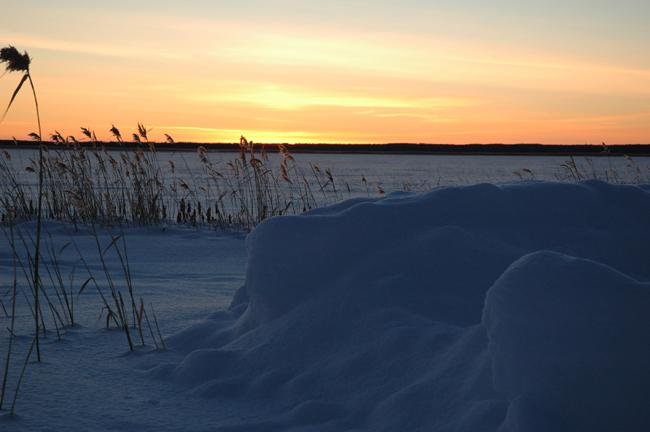 Except for a handful of isolated places, lakes in the Deer River, Grand Rapids area remain cold for this time of year. The surface temperatures are still hovering around 58 degrees, some higher and some lower. I haven't found any surface temps over 60 degrees in the past 4 days and this has been holding up the show for Crappie and Sunfish that were already staging in their spawning areas. Warmer temperatures later this week could trigger a sudden panfish movement back into shallow for a few days, so keep that in the back of your mind. Lake Winnibigoshish was the scene for my fishing trip on Monday and luckily for us, the morning storms blew through before we started fishing. More good luck, the predicted afternoon series of thunderstorms, never materialized. So except for windy conditions, we were able to stay dry and relatively comfortable. Fishing with long time customers and friends, Skip & Sandy Finch, the game plan was to stay out of the main flow of strong winds blowing in from the East-Southeast. With that particular wind, fishing in Tamarack Bay is kind of a "no-brainer", so I headed for the area we still refer to as "the satellite dishes" and along with a dozen or so other groups, drifted the shoreline break in 7 to 9 feet of water. Using an 1/8 ounce jig and minnow, mixed Walleye and Perch action was slow, but steady and we picked up a fish or two on each drift until the action fizzled out around noon. We headed across the bay to the river channel and fished the area from the Three Sisters all the way up to Teds Hole on Tamarack Point. Walleyes were spotty, but we did encounter loosely schooled groups in several areas along the way. Again, fishing was slow, but steady and we stuck to the program until nearly 5:00 PM. One last trip across the bay before heading in, we stopped in front of Sunset View in Haubrich's Bay and located one last school of fish, this time in 6 to 7 feet of water. By 6:00 PM, with one last flurry of action under our belts, we headed for the dock. Considering the conditions and our propensity for loosing fish halfway to the boat, we had a really good day. Our final count was 15 keeper Walleyes and we released another dozen or so "slot-fish". The Perch were really on the small side, but we kept a dozen of the "best little fish" we caught. Northern Pike were almost non-existent on the particular day. (5/31) On Big Sandy Lake, near McGregor, My former co-worker and long time friend Tim Higgins sent an email update of their fishing trip. Tim, his grandson Paz along with Tim's brother Matt caught 19 Walleyes, some Jumbo Perch and some Northern Pike. They caught all of the fish using jig and minnow. For 5 year old Paz, these were his first ever Walleyes, so the trip is not likely to be forgotten any time soon. Way to go boys! (5/31) On Leech Lake, Arne Danielson said that fishing the sand break near Five Mile Point was steady on Monday. They fished a variety of sections along the breakline between Five Mile up to the Three Sisters. Arne said they boated over 30 Walleyes, some wer too small, some were too big and some that were just right. They left the lake with their limit of "keeper size" Walleyes. Somehow, the Perch that were located in this area at the beginning of the weekend, have disappeared. Arne said that only a few Perch were caught and of those, only a couple were keepers. (5/31) On Ball Club Lake, from Gus at Gus' Place Resort Gus reported on the fishing conditions. In his own words,: "This past week...we witnessed a good example of Mother nature gone mad, or at least overboard with the largest hatch of Non-biting Aquatic Midges I have ever seen!! These insects are also called "Fuzzy Bills". Researchers agree that Midges are a highly desirable organism in aquatic habitats. Midges are an important food source for fish and predatory aquatic insects. 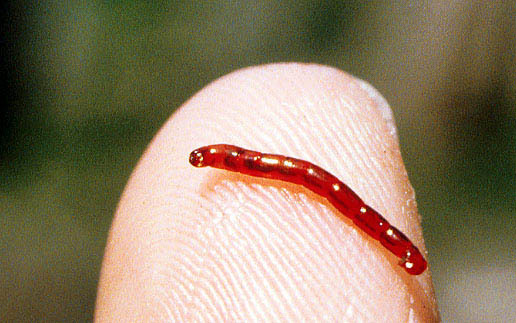 The Midge larvae, also called "Blood Worms" perform an important function in our lake by consuming & recycling organic debris." Gus added that even though Midges are an important sign of a healthy lake ecosystem, he has had enough bugs in his face to last the rest of the summer and he's glad that they are gone now. On Ball Club where lake levels are high, which Gus says is good. Surface water temperatures are ranging from the mid 50 to upper 50 degree range. Despite the abundance of forage available this past week fishing is really turning on for Walleye, Crappie & Northern. I wouldn't say we have neared the peak bite by any means; we are just catching some nice fish. Both the North and South end of the lake seem to be the most productive. The deep middle of the lake will come into play as the weather turns hot. 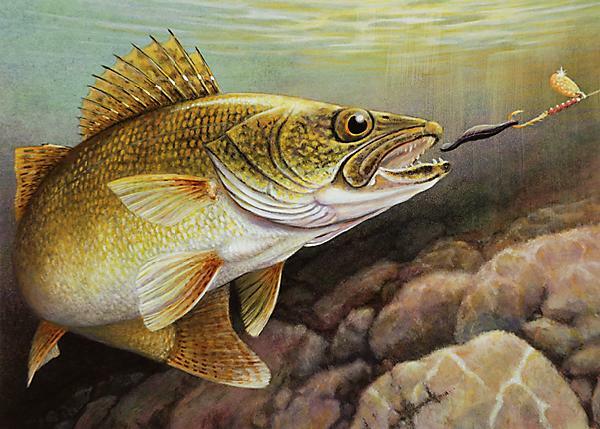 Walleye fishermen are doing well on Leeches with slip bobbers or Lindy rigged in 10-12 feet, anchored or moving slow. Crappies on small jigs & minnows and Northerns on spinners. (5/31) On Sand Lake, James "Jughead" Allen reporteed that his son Cale and a friend managed to catch 6 Walleyes, a bunch of Jumbo Perch and 40 or more of the Sand Lake special Northern Pike. The action was good and this could be a sign that Sand, which got off to a sluggish start this year, may be ready to turn on. (5/31) From Red Lake, Chad Haatvedt spent the day fishing for Walleyes and boated lots of fish. They caught lots of "slot-fish" in the 18 to 20 inch range, not many that were larger. They did get enough "keepers" to fill out their bag limits and Chad also caught one of the few remaining Crappies from the giant lake. At last report, this one was headed for the taxidermist, it was just shy of 15 inches, a trophy by anyone's standards. Search the Wired2Fish website for tons of great fishing tips, videos and articles. 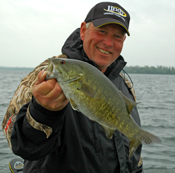 Fishing Report May 30, 2011 Jeff Sundin The next time you're engaged in conversation with someone about kids and how they spend all of their time texting and playing video games, remind them about today's fishing report! For me, Sunday was another one of those lucky days when I got a glimpse of a couple of kids from the next generation of fishing and guess what, they reminded me of me! When I arrived at William's Narrows Resort on Cutfoot Sioux, to pick up Travis Krug and his two boys Zachary (10) and Jacob (13), Travis said he'd have to go "round up the kids" who were off somewhere fishing from a dock. Toward the end of our fishing day, which lasted nearly eleven hours, the discussion between the two boys was focused on getting back to the resort so that they could get out with their Grandparents for the late evening Crappie bite. Somewhere in the middle, we spent the whole day fishing and never a discouraging word was spoken, almost. Sure reminds me of "the old days". On Lake Winnibigosh, we had hoped to cash in on the hot tip I got from my friend Joe Thompson about the fast and furious Perch action that his crew got into on Saturday, when we got out on to Lake Winnie, the surface was smooth and full of float debris from Saturdays storms. 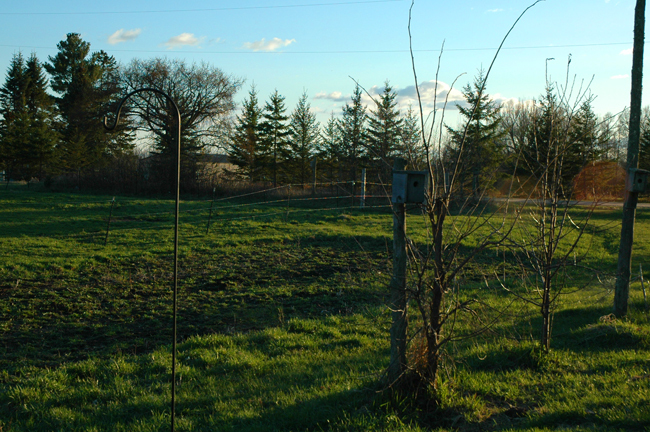 With the surface temperature hovering at 56 degrees and calm, sunny skies predicted, I knew that I'd have my work cut out for me. Our first stop was on the West side, near Raven's Point where we fished out on the flats in about 12 feet of water. The humminbird was showing that there were fish scattered all over the flat and as soon as we started jigging, we began catching Perch in the 9 to 11 inch range. As we got near the rocks, we caught a couple of Walleye's including Jacob's largest Walleye to date, a chunky 22 incher. We fished the flat and the rocks, picking up ocassional fish until the crowd built up to a point that it was impossible to steer the boat and I headed for less populated water. Next, I tried the flats between Mallard Point and Raven's Point, but the results here were disappointing. We had some sluggish strikes and caught a few small fish, but not much went into the larder for shore lunch, so we headed South toward Sugar Point. Fishing the shoreline break in ten feet of water, paid off a little better for us. Here we caught several "keeper Walleyes, a couple of "slot fish" and a few more Perch. Now we had enough for lunch and took advantage of the opportunity. After lunch, we picked up a few more fish on the breakline at Sugar Point, then headed toward Stony Point where we found another school of fish, this time shallower. We fished here with jigs and minnows in 6 to 8 feet of water on the breakline between the rocks and a deeper weed patch. Walleyes, Pike and Perch were mixed in this area and for an hour or so, we had good action. By now it was 6:00 PM and we started working back toward Cutfoot, checking a couple of small rock humps along the way. The rocks were holding a few Perch, but not many, so we called it a day. All things considered, it wasn't bad for fishing the aftermath of the storms. We had plenty for lunch and wound up with a dozen keeper Walleys, some nice Perch and a few bonus Pike. On Leech Lake, I got a fishing update from my friend Carol who has the "Fishy Gifts" Store in Pine River, www.fishygifts.com where I plan to buy myself a Father's Day Present. Their timing for a fishing trip to Leech lake brought them there on a tough day for the big lake, calm and sunny isn't a great combination over thyere. But they still managed to have some fun! 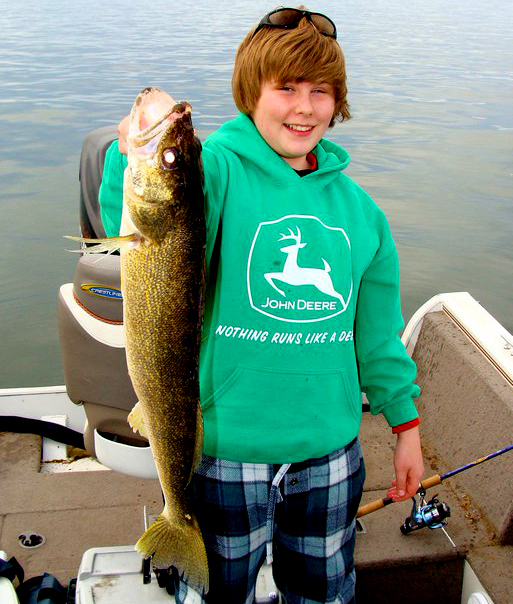 Fishing near Sugar Point, Carol's son Jesse bagged his largest Walleye to date, a gorgeous 25-1/2 inch lunker Walleye. 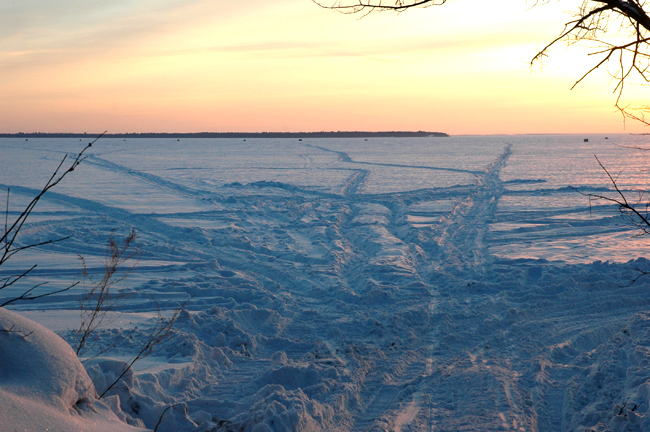 I'm out of time, but I have updates coming in from Red Lake, Lake of the Woods and Bowstring. Please check back on Tuesday. Fishing Report May 29, 2011 Jeff Sundin On Saturday, we had every kind of weather you can imagine. Everything from calm seas with sunny skies to lightning storms with 5 foot swells. It didn't make it easy to form a game plan for fishing, but we did manage to work our way through it and find some cool things to do. All of the weather changes did present me with chances for some great photos, most incredibly, the lucky number picture for today. At about 3:30 PM, I mentioned that I needed a great picture for my lucky number. A few minutes later, someone was smiling at me and sent a gift of the Loon that popped up just a few inches from the boat. The Loon stuck around as a model and let me have some great pictures. Our fishing plan was to work Leech Lake first for Crappies and then for Walleyes. The weather forecast was a concern, but we figured that we'd be able to find holes between the showers and we did. Crappie fishing on Leech Lake had been good during the past week and when we first started, it looked like there was still some potential. We fished in about 6 feet of water near a submerged weed bed that had a sparse patch of Bulrushes nearby. Scratching around the area using 1/8 ounce jigs, crappies minnows and bobbers set at about three feet, we managed to catch seven Crappies before the wind started making things dicey. Maybe we'd have caught more, but it seemed like a good time to get out onto the lake before the waves made traveling too uncomfortable. Our first stop for Walleyes was in the Sugar Point and Battle Point area. By now the waves were kicking up a good chop on the lake, so I set up a controlled drift using the drift sock off the bow and running the OptiMax in reverse, backing into the waves. We fished rocks at about ten feet deep and picked up 8 to 10 Walleyes, mostly "slot fish" before the first major rain cloud hit us. The waves kicked into high gear and what had been a nice, controlled drift, turned into a chaotic mess as the wind blew the boat along at about 2-1/2 MPH. It was time to bail out on this spot and look for calmer water so we put the boat on the trailer and drove up to Federal Dam to look the situation over. At Federal Dam, the main storm had blown through, so we headed back out onto the lake, this time heading across to the West side of Portage Bay. We moved down into the Two Points area where we were on the protected shore and the water was calm. As soon as we got back up and running, we started getting strikes. Not all of the fish were easy to catch, but some were aggressive enough to let us win the occasional battle. We fished rocks in 7 to 8 feet of water using 1/8 ounce Lindy Jigs tipped with Shiners. Walleye action wasn't hot, but it was steady and we managed to pick up another dozen or so along this stretch of shoreline. Unlike the East side where there were large schools of Perch, the West side hosted only small numbers. We did keep a half dozen of the better sized Perch, but it didn't look like the place to find the mother lode. All things considered, it was a great day when you take into account the conditions we had to work with. The fish are clearly still active, so a better weather forecast should be your signal to go ahead and give Leech Lake a whirl. (5/29) On Lake Winnie, Joe Thompson from Four Seasons Resort reported that Saturday was a tricky day to catch Walleyes. They were able to find fish, but the "hot bite" that they've been enjoying was hampered by the high winds and ocassional storm cloud. Joe said that Perch fishing on Saturday was fantastic though. In many areas, they caught Perch while they were searching for Walleye and when they found an above average school, tyhey used cut piece of minnow and fished vertically over the side of the boat. 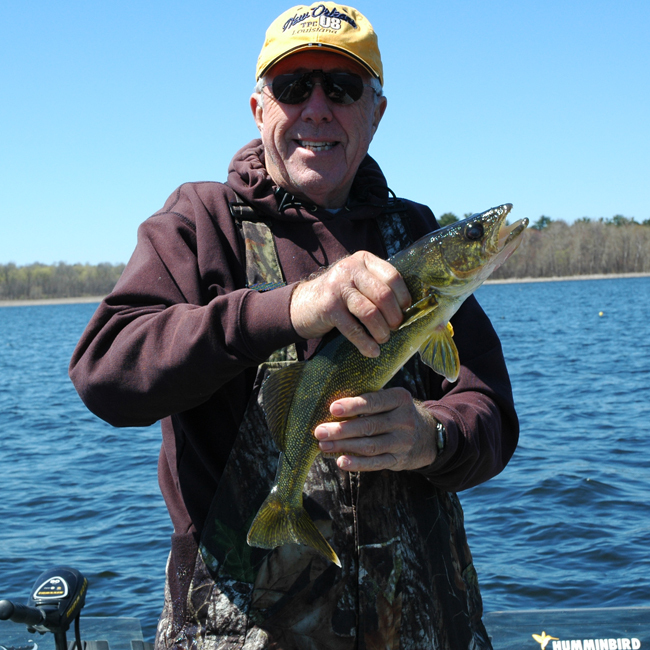 (5/29) On Bowstring Lake, Arne Danielson says that fishing for Walleye is okay, but not great. On Thursday, he was able to locate small schools of active fish in the weeds. They were sometimes hard to locate, but when he found them they did bite. On Friday, finding them got even trickier and the result was less impressive. Bowstring isn't a lake that likes a lot of weather changes and it's prpbably going to benefit from the warmer and more stable weather that's predicted for later this week. Fishing Report May 28, 2011 Jeff Sundin Well there's sure no shortage of water in the Itasca area right now. In typical Memorial Day weekend fashion, the cold rainy weather sorted out the casual from the die-hard fishermen on Friday. I couldn't make up my mind which way to go exactly, so I just let the truck drive me to where it wanted to go and we wound up at Leech Lake. Surface temperatures when we arrived were hovering at 56 degrees and the Southeast wind was making the quintessential "Walleye Chop" on the lake. My first stop was the sand point at the North end of Portage Bay where we'd done well a few days ago. We picked up a couple of Walleyes to get the ball rolling, but it was clear that there wasn't any large school of fish waiting for us, so after a couple of passes, we started moving down the Western shore of Portage Bay. The area South of the Leech Lake Campground all the way down to Two Points was really quiet and I never found much to get worked up about on that side. The water was rough enough to force my decision to run over to the East side of the bay and I headed for Five Mile Point. At Five Mile, the stretch of water South of the point was calm and except for a couple of "slot-fish", action was minimal. We moved up the shore toward the Three Sisters and this is where we finally connected with some fish. There was a lot of baitfish on the sand flats in 7 to 9 feet of water and my Humminbird was lit up like a Christmas Tree with fish. Almost as soon as we started our first drift, the fish were hitting. Around 1:00 PM, there was a slight wind shift to the South and the Walleye action peaked during this transition. By 2:30, the rain had set in and Perch began to take over as the dominant target. Fishing with 1/8 ounce Lindy Jigs tipped with Shiners, Rainbows and Fatheads, we continued catching Perch steady and still managed to land a Walleye or two on every drift. Almost all of the Walleyes we caught were "slot fish". The action was wonderful, but be for-warned, if you're looking for a giant pile of eaters, this isn't the spot. But if you're into the action and want a chance at a big one, this might be kind of fun. By 5:00 PM, I was still looking for a couple of keepers, so we headed up toward the river mouth and fised the breakline in 8 feet of water. Within a half hour, we'd caught our two keepers and a couple more bonus "slot-fish", one of them a 26 incher. Rumors at the cleaning station were that this area had been good earlier in the afternoon as well. (5/28) On Lake Winnie The crowds will be big this weekend on the big lake because the Walleye fishing continues to be good. On Friday, the Southeast wind forced a change of location for anglers who had been concentrating on the Northwest corner near Stony. Most of the action shifted toward Tamarack Bay where there have been fish on the flat, along the river channel and on the shoreline near Plughat Point. According to one of my friends, there has been some action in the Southeast corner of the big lake from the "re-claim" down into Evinrude Bay. Even though it seemsd cold and spring-like, some of the Walleyes are starting to move out accross the flat and anglers are beginning to pick up some fish on the drop near Moxies Hole. Presentation is still 90 percent jig and minnow, but there are a few guys swearing by their Leeches already. If that's your favorite style, it will work, so don't be afraid to start experimenting. (5/28) Pike fishermen. News about the fishing regulations on the lakes with "experimental Pike regulations". The legislation to eliminate the special regulations and some of Minnesota's better Pike waters, reached Governor Dayton's desk and he vetoed the bill. For dark house anglers, this won't be welcome news, but for many of us who would to love to see the comeback of large Pike in Minnesota, this is great news. Read the Veto Letter here. Fishing Report May 27, 2011 Jeff Sundin Cold snap spells "Cold Shoulder" for Walleye anglers. Temperatures in the Deer River area on Thursday morning ranged from the low to mid 30 degree range. The crisp, calm morning and bright blue sky were delightful to look at, but didn't do much for the fishing during the early part of the day. I picked up my customers Skip and Sandy Finch at about 8:45 AM and our goal was to gather some Walleyes for shore lunch on the North side of Lake Winnie in the morning. When we put the boat in the water, surface temperature was 53 degrees, down from 58 degrees on Wednesday. I stopped at several places along the shore between the Rock Pile and Stony Point, fishing the flat water was discouraging because the fish were widely scattered and really reluctant to bite. Many of the fish that did strike, were hooked only briefly before they managed to work free of the jig and we lost more fish than we caught. It wasn't a complete bust, each of them caught nice "slot fish" and we boated some Northerns too. We had enough fish for lunch, so we took a break, hoping that a warm up in the afternoon would be helpful. The afternoon sun did improve the surface temperatures, bring them back up into the 60 degree range. The Walleyes were responding and when I talked with my friend Jim Trombley, they were among a pack of boats near Stony Point and he said that they were all picking up some fish. By the time we got back out there, the bite was fizzling out, be we saw enough action to get us interested. Accross the bay at Mallard Point, I found a mix of Walleye, Perch and Pike out on the flat in 11 to 12 feet of water. Backtrolling with the MinnKota at about .7 MPH and dragging the ligs like a Lindy Rig, we were able to start bringing some fish into the boat. It was easy to see fish and the only trick was to keep covering ground. By the end of the day, we had a respectable cooler of fish. (5/27) On Blackduck Lake Ryan Klein says that Walleye fishing has been good lately, the fish are starting to expand out into the lake, providing a wider variety of locations to choose from. Walleyes are moving a bit deeper, so start to look in the 10-12 foot range during the daytime, 6-8 foot range during early morning and late afternoon. Wind blown points have been provinding the best Walleye action lately. Leeches and shiners are both doing the job right now. Ryan says that there is a huge year class of 18-19 inch Walleyes this season and that's been mainly the fish that they're catching. (5/27) On Ball Club Lake Gus' Place Resort. Gus reported that water levels are high and in good shape on Ball Club right now. He added that surface temperatures are hovering just below 60 degrees. Fishing presentation that's been most effective is Lindy Rigs with live bait fished in about 10 feet of water. Until water temperatures rise, Gus expects this pattern to prevail, he thinks at least another week. With warmers temperatures, panfish should start moving toward the shallows as well. Fishing Report May 26, 2011 Jeff Sundin Wednesday was the last day of a three day stint with Larry, Tim and Jessie. We already had all the fish we needed from two previous days of fishing and we had planned to stay close to home and make it a nice relaxing morning and short afternoon. Yeah Right....When we put the boat in the water at Plug Hat Point and headed out to Tamarack Point to try and catch some of the Walleyes from Ted's Hole, the fish were as tight lipped as they could be. The overnight temperatures had dipped into the upper 30 degree range and this is what caused the trouble. With surface temperatures now hovering around 54 degrees and a high bright "cold front sun", the fish needed a little time to warm up. Naturally, I could never just sit there and wait for the fish to start biting, no, I started running all over the lake trying to find a better bite. Moving first toward the river channel near Bowen's Flats, we found a school of Perch, interesting, but not what we had in mind. Next stop Highbanks, not much action there either. Then we moved South to Musky Bay where it looked like things were going to turn our way. We had five or siz fish on our first drift, but after picking up only a few more straglers, I was looking for another move. We stopped in at Moxies Hole and picked up a couple more Walleye, but still no "hot bite". By now the wind was blowing and the lake had a good chop going. We were chatting about how the rocks get good when the wind blows and pretty soon one thing led to another and you guessed it, now I was pounding my way accross the lake, heading for the rock spine at Raven's Point. It was a little pain getting there, but within minutes after stopping, we knew that it had been worth the ride over. Walleyes and Jumbo Perch were stacked on the rocks and hitting agressively. We had doubles and tripples several times and except for the odd times when someone would get stuck in the rocks, there was literally a bite on every cast. Our best fishing was in about 9 feet of water just off the outside edge up-wind of the rock spine. An 1/8 ounce Lindy Jig tipped with a minnow is still the bait of choice. We got double use out of every minnow because there was a Caspian Tern that picked up every single one of the discadred minnows from the surface of the lake. 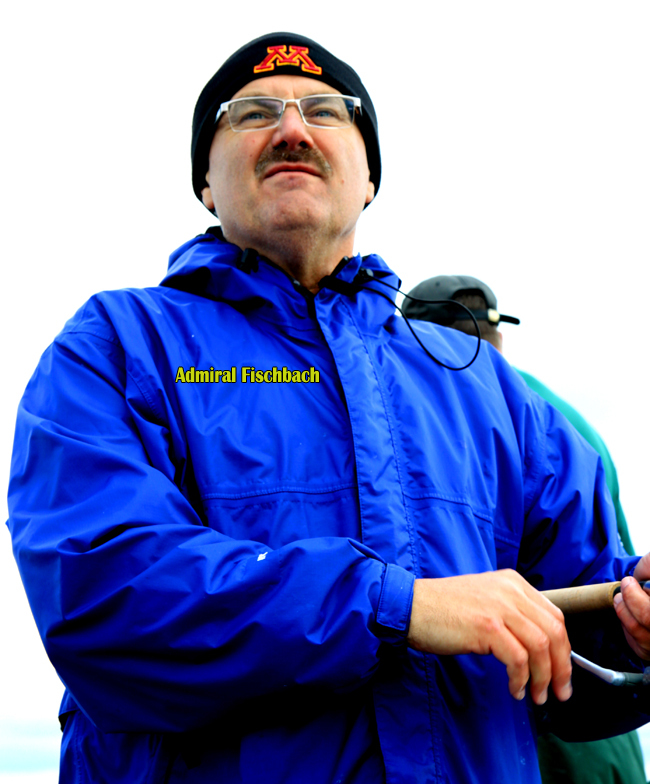 Fishing Report May 25, 2011 Jeff Sundin On Tuesday, I was a little nervous about heading for Leech Lake because I hadn't been hearing too many glowing reports about fishing on the big water. My lucky charm was working over-time for me though and it turned out to be a great day in more ways than one. When we arrived, the surface temperature was 57 degrees and the North wind had a little bite to it, traffic on the lake was really light and no matter where we looked, 3 or 4 boats was the biggest crowd we spotted. Just to keep the first ride of the morning short, I started at the North end of Portage Bay on the shoreline break in 8 feet of water. Within 5 minutes we had our first Walleye on the line and by the end of our first drift we'd already baoted at least a half dozen more. On every drift, I expected the action to fizzle out, but there were a mixture of Walleye and Perch holding tight to a shallow sand point, located just inside of the deeper weeds. I guess we spent about three hours fishing this one small area until we finally got curious about other spots and left, but the action never did fizzle out. As we moved around the lake, every spot we checked had a few fish and we usually picked up two or three within minutes of stopping at each new location. There were a lot of "slot-fish" ranging in size from 19 to a high end of 25 inches, but we did manage to catch a dozen "eaters" as well. The Perch were running just around 10 inches, some a little better, some a lttle smaller and we kept about 15 of the better ones. Now that we'd had a great Walleye day and our confidence was high, we headed for one of our favorite Crappie spots hoping to finish the day with a little panfish action. At first, it didn't look like I'd find them and by the time we'd checked three or four of the shallow spawning areas, we were almost ready to move back out and fish for Walleyes again. My lucky charm smiled at me one more time as I headed for "one last spot" and finally found the fish in the deeper weeds, apparently staging for a run into the shallows when it warms back up again. Once we found the fish, it was only an hour before we had limits for all three of my customers. We fished with 1/8 ounce jig and minnow combinations for everything. Walleyes were happy with the Shiners we were using and for the Crappies, we switched to small fatheads and added bobbers. 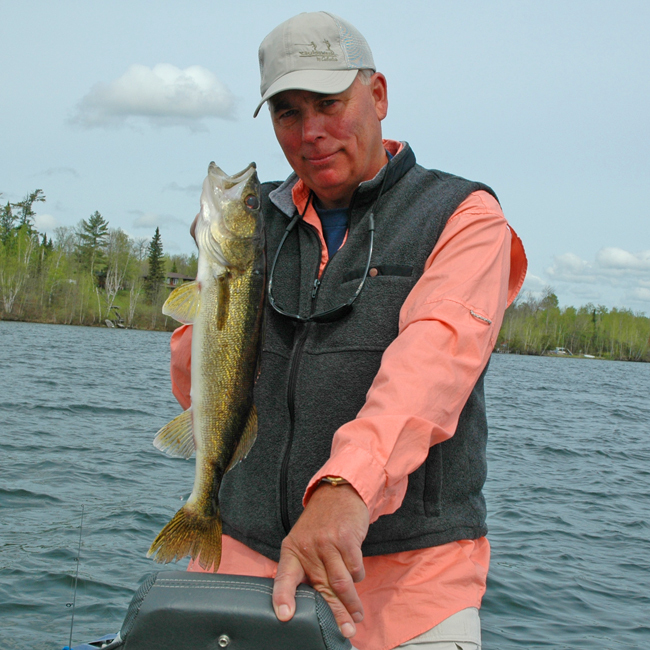 (5/25) Bemidji Lakes Area and NMLOG Member, Paul A. Nelson says; Memorial Day Weekend is consistently one of the best walleye fishing weekends of the summer. Walleyes have been done spawning for at least a couple of weeks and the larger female walleyes are starting to show up in the shallows ready to feed. Anglers have been finding walleyes on shoreline structure on most of the larger lakes. The key features on structure attracting most of the walleyes are either cabbage weeds or rocks. The areas that have both rocks and weeds can be excellent, especially if they have deep water access nearby. Smaller lakes may not have enough shoreline related structure, so walleyes may move off shore and seek out mid-lake humps and bars sooner than on the large lakes that have plenty of shoreline structure. Spotail Shiner minnows have been the key bait on most lakes, with the shiners moving into the shallows to spawn. Anglers have been using jigs and shiners with good results, especially on lakes with natural populations of shiners. Walleyes on smaller lakes that don’t have good populations of shiners may respond better to leeches and night crawlers. Anglers have another option this weekend with the bass opener in most of Minnesota on Saturday, May 28, 2011. Bass spawn when water temperatures reach into the 60s, so the vast majority of the bass will not have spawned when the season opens. Most lakes in the Bemidji area currently have surface water temperatures in the mid-50s, with many lakes actually dropping in temperature this past week with the rain and cooler temperatures. Panfish action continues to be good in many of the smaller lakes and back bays of the larger lakes, with anglers finding crappies and sunfish actively feeding in the shallows. Fishing Report May 24, 2011 Jeff Sundin Our first wind change since the fishing opener occurred on Monday when the Easterly flow gave way to a moderate cold front coming in from the North. In mid-summer, the change would cause a dramatic slow-down in fish activity, but since the water is still cool, the affects of this change were less dramatic. On Lake Winnie, I stayed in touch with friends who were fishing on the West side of Winnibigosh where the action had been fantastic over the weekend. NMLOG Member, Tim Dorholt reported that Walleye activity had slowed, but that they were still catching fish. In his words, "we're picking up a few fish on every drift". The mix of fish was typical for this time of year, some larger "slot-fish", some keeper Walleyes and a healthy smattering of Perch and Pike mixed in too. The breakline from 8 to 10 feet of water has been the best area to fish and jig and minnow combinations will do the trick. Craig Lenz of Hutchinson MN, shared a really great photo that he got from the Third River area on Lake Winnie on Sunday. 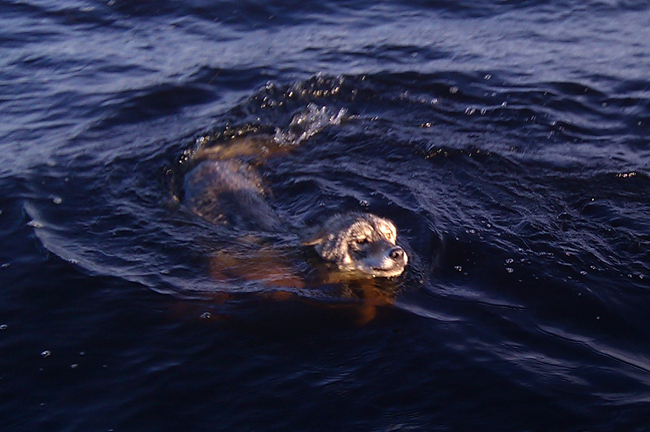 As they were Walleye fishing, they spotted a mature Timber Wolf swimming across the bay. In addition to the photo of the Wolf, Craig reported excellent Walleye fishing on Mallard Point over the weekend. He said that they caught most of their fish using a jig and minnow, but they also did well using leeches. Their best depth range was 3-1/2 to six feet of water. My fishing day was spent over on Jessie Lake, North of Deer River. With surface temps ranging from 53 to 59 degrees, Jessie still has relatively cool water temperatures and I think the better fishing still lies ahead for this lake. But it was the kind of fishing day that I sort of like. Not a wide open, action bite, but just enough fish on the prowl to keep the trip interesting. I had to do a lot of moving to find small pods of fish that were scattered along the shoreline in 6 to 9 feet of water. But when we found fish, they were fairly aggressive and we were able to pick up several from each spot. In addition to the Walleyes, there were some Perch and Northern Pike mixed in too. For us, there was a peak in the action just around 1:00 PM and as I continued to use up fresh territory, the bite got tougher. By late afternoon, we were down to scratching out the last couple of Walleyes for the cooler. There were also some highlights that will make the day memorable, a hand full of larger Walleyes, including a 25 incher and a 21 inch Smallmouth Bass that just couldn't wait for the season opener before she attacked my jig and minnow. On Leech Lake, there are reports of multi-species action too. My friend Vern Valliant says that Sucker Bay is offering anglers a chance to catch a mixed bag of Perch, Walleye and Northern Pike. In Portage Bay, the Walleye action is improving and there is a mix of fish favoring the larger slot-fish, but with a smattering of "keepers" mixed in too. Panfish action was good for anglers over the weekend, but we'll see if the colder weather moved the fish back into deeper water or if they stayed near the spawning beds. Fishing Report May 23, 2011 Jeff Sundin If you measure the success of a weekend by the weather, maybe you were disappointed. 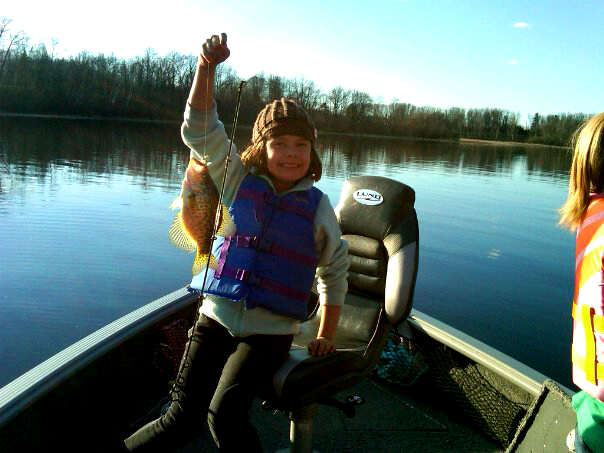 But for lots anglers who visited Northern Minnesota, the fishing this weekend was awesome. In spite of an all day rain on Saturday, the water temps were stable and on sunday, we got a break from the rain just long enough to warm things up a little more. For anglers who may have had trouble catching Walleyes this weekend, here's a tip that will help in the future. On this particular occasion, location was the main factor in catching fish. They were definitely feeding, so if you didn't catch them, it might have been because you missed finding them. If you were on a lake like Winnibigoshish, where lots of people were "smokin' the Walleyes" but you still struggled, then this might be a good time to hone your skills with your electronics. If you want help with that, all you need to do is ask and I'll gladly lend a word of advice. What we found on Winnie this Sunday was a classic example of "finding the baitfish to find the Walleyes". Large, sandy flats with soft tapering breaklines held huge schools of minnows and the hungry Walleyes were in the neighborhood to pig out. I went to several spots where I thought the fish should have been, but the Humminbird said no. When I went where the Humminbird said yes, we caught tons of fish. Water temperature was a factor in finding the minnows and we learned that the best fishing areas were mainly on the West side of the lake where a weeks worth of East wind has blown in warmer surface water. There was a difference of almost seven degrees between Winnie's North shore near Pidgeon River and Ravens Point on the West side. Water depth has been varying with the wind and sun conditions and if you talked to me three times in one day, I may tell you three different depths. Yesterday, it was 8 to 9 feet, last week it was 10 to 14 feet and today it could be 6 feet. A good rule of thumb, when the breeze picks up and current becomes stronger, the Walleyes tend to move shallower and begin using rocks, points and other well defined structure. Sunny, calm conditions force some fish to spread out on the flats and others to move into deeper water along the drop-off. It's really helpful to get in the habit of being "tuned in" to the weather and make adjustments whenever the conditions change. I have to share a comment that came on my facebook page because this is a really common mis-conception about Walleye fishing. My answer: I would love to get my chance to convert you. I'll bet you would be one of my favorite pupils on my pet subject, minnows. We were on the West side of winnie yesterday too and caught dozens of Walleyes without ever even touching a shiner. Sometimes, having confidence in your bait makes a difference and I know how easily habits are formed. But I absolutely promise you that when the Walleyes are feeding as they are right now, small rainbows or "nice" fatheads will work great. I will admit that I do not like small, black-faced fatheads, now or at any time of the year. But there are lots of other good choices that will catch folks plenty of fish. All I ever do is see what they have in the tanks and make my decision by choosing minnows that I think are the "best size". I've used Dace, Rainbows, small Suckers, Golden Shiners, Fatheads and others. As long as the minnow is around 3 inches long and works well on a jig, it will work. Later this spring, there will be a time when the fish get much more selective, but it won't happen until after the major insect hatches occur and the fish have had a chance to bulk up. At a time when you're talking about paying $.50 each for minnows, I thinks it's important to keep all of your options open. (5/23) Crappie Fishing continues to be good for persistent anglers who locate their spring habitat. 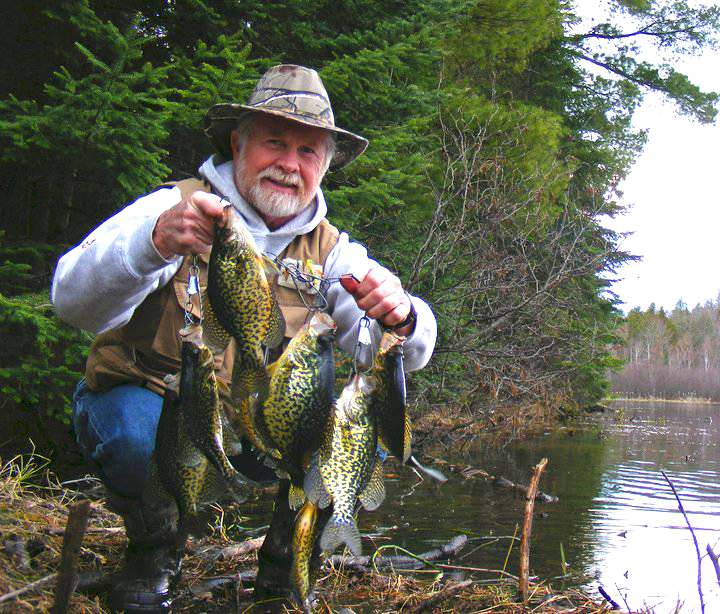 On some lakes, Crappies are already on or near their spawning areas and anglers have been finding them in shallow water, bulrushes and areas with mixed sand and gravel. There are still some colder water lakes where folks are finding the fish on deeper breaklines near the spawning areas. With water temperatures just moving into ideal range in a lot of places, this should be a good week. Bluegills and Bass are staging on the breaklines too and will also be up in the shallows really soon. On some lakes, they may even already be tinkering around their nesting spots. Fishing Report May 22, 2011 Jeff Sundin On Saturday, we had planned to fish on Bowstring Lake, but decided against it at the last minute because of the weather. An all day rain with a breeze was predicted and just in case the forecast came true, I wanted to be on a smaller lake where we could "hide" from the wind. As it turned out, the forecast was right and until the last half hour of fishing, we sat in the rain all day long. Luckily, the fish weren't as put off by the weather as we were and their cooperation helped make it a fun day for us in spite of the conditions. There were lots of reasons to smile, but during the late afternoon it got better and soon, there were smiles breaking out everywhere. The bite was a mixture of Walleye, Smallmouth Bass and Northern Pike. They were all mixed together and at times, we'd get all three in the same spot within just a few casts. Fishing wasn't all that tricky, but the fish were scattered. Maybe it was the low pressure system or maybe the baitfish are scattered or maybe the fish were just spooky. Who knows, but it was a good day to learn "new spots" because everywhere we went, we would catch a half dozen and then the bite would fade out. Move again and get another spurt of action and the scenario went on like that all day long. The strategy turned out to be finding points along the shorline drop-off in 7 to 12 feet of water. Weeds, Clams and scattered gravel all made the spots better, but there were even fish on clean sand if there was a good, shallow flat near by. 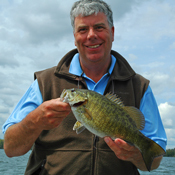 Rocky areas were good for Smallmouth, but seemed less attractive to Walleyes. The best spots for Walleyes were points that contained Bulrush patches. In some spots the Walleyes were up close to the Bulrushes, in other spots they were out along the break-line instead. Jig and minnow was the only presentaion we used. For us 1/16 ounce jigs were better than 1/8 ounce, but either of them worked. There was absolutely no preference when it came to minnows. The fish hit equally well whether we used Shiners, Rainbows or Fatheads. For some reason, I never got around to trying artificials, but I'll make it a point to do that today. Water temperature on the surface was in the 58 to 60 degree range and in spite of the rain, remained stable all day long. That means we're on the verge of the spawning season for Bass and Sunfish. The Crappies have already begun moving into spwaning beds and depending on the lake, anglers are finding good Crappie action already. (5/22) Amazing what a smile does to make Multi-Tasking go smoother! We're gonna get wet again today, but it's okay, the fish won't know the difference. Fishing Report May 21, 2011 Jeff Sundin Friday was the perfect fishing day. Overcast with slight breaks in the cloud cover, breezy and warm. Surface water temperatures on Island Lake were in the 58 to 60 degree range over most areas of the lake. We found one small bay where water temps had exceeded 64 degrees. Our goal was to keep some Pike for eating and we accomplished that. Along the way, Walleyes, Smallmouth Bass and Perch were also in good supply. We fished main lake breaklines in 8 to 12 feet of water with 1/8 ounce jigs tipped with fatheads. The best fishing was in areas were softer bottom structure was home to some sort of insect hatch. The fish we caught, especially the Perch had been feeding on bugs or larvae and were a little slow to bite, but they were catchable. On this occasion, jig color seemed to make a big difference, the green with black combinations had something special about them. For Lake Winnie anglers, reports from the North Shore were excellent on Friday! Bowen Lodge has a new Cutfoot-Winnie report posted so you can get the complete report >> Cutfoot and Winnie fishing info here. Fishing Report May 20, 2011 Jeff Sundin Thursday morning started out looking like we'd be in for some rain or at least a cloudy day. Instead, clear skies moved in from the Northwest and we had another gorgeous, warm day on the lake. 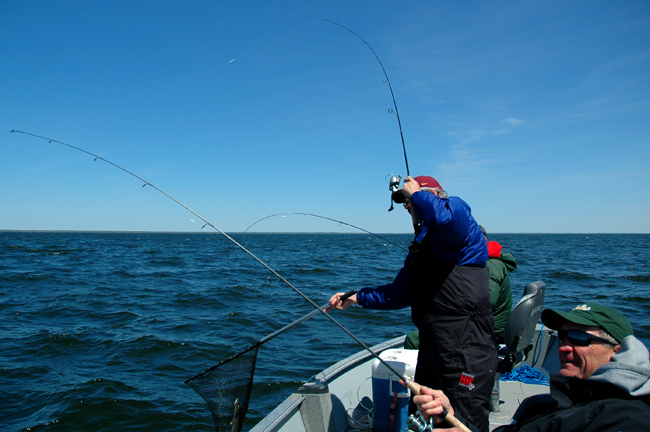 We spent our day in full sunshine as we fished the North end of Lake Winnibigoshish. We already had our limit of Walleyes from our fishing trip on Wednesday, so we were Perch fishing today. We had set a goal of ten inches or better for the "keeper" size fish and we did manage to get them, but I had to travel all over the lake to do it. The action was good, but the average size of fish was slightly below our goal. Now if we'd had a goal of say, 9-1/2 inches instead of 10, we'd have been finished up easily before lunch. We caught several hundred Perch and estimated that we released 5 fish for every one we kept. It was 6:30 PM by the time we sorted through them until we had 40 ten inchers. Along the way, we also caught a bunch of Walleyes and a few Pike that were on the smaller side too. Most of my friends were out for Walleyes and I talked to several of them throughout the day. All of them reported good to excellent Walleye fishing in both Winnie and Cutfoot. Bowen Lodge has a new Cutfoot-Winnie report posted so you can get even more specific Cutfoot and Winnie fishing info here. (5/20) Shiner Report, Thursday was a big day for the Shiner Trappers. Lots of minnows in the shallows and lots of minnows in the traps. 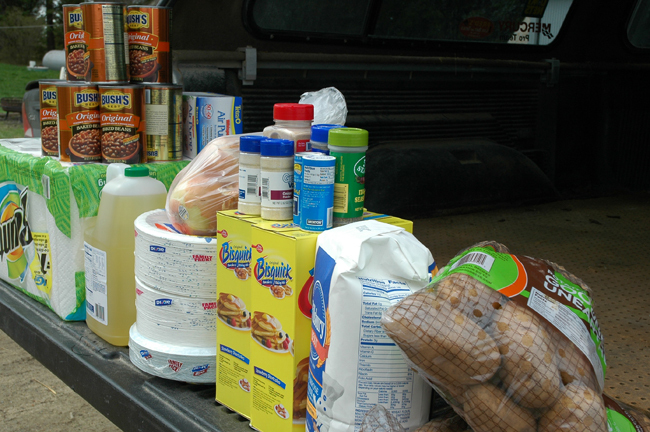 Supplies should be good to excellent for the weekend, so anglers heading this way can drive with a smile on their faces. (5/20) On Ball Club Lake Gus' Place Resort. On May 18th the water temperatures were hovering between 50 and 52 degrees, so they're still anticipating the best fishing as temperatures rise. Gus says that right now, most fish are in shallow water, 10 feet or less and do not show on your sonar. Live bait presentations are the most productive fished SLOW! using slip bobbers or small jigs. Gus' boat harbor has water temps in the 54 - 55 degree range has exploded with all varieties of fry. Massive schools of small fish can be easily seen with the cement boat ramp as back drop. Fishing Report May 19, 2011 Jeff Sundin Water temperatures remain cool, but sunshine and calm seas are helping the lakes "catch up" to average spring temperatures. The temperatures still vary wildly from one lake to the next, but on Wednesday, we started our day with surface temps in the high 50 dgree range and ended the afternoon with a surface reading of 64.5 degrees. That was on Bowstring Lake and it was on the West side where the breeze was blowing warmer surface water toward the shoreline. In other words, I'm sure the temperature was cooler on the east side, but the trend is moving in the right direction. For us, fishing on Bowstring Lake was steady, but never fast. In the morning, I searched for fish in some of the shallow spots where I thought there would be Shiner Minnows running the shoreline. But between the sunny, calm conditions and water temperatures that had dipped with the overnight chill, open areas without cover were slim pickin's for us. Once I started looking in the weeds, life got better and we'd find small groups of fish hiding in areas where the green cabbage weeds were growing. In some areas, the Pike were making mincemeat out of my jig supply, but the rule of the day was no weeds, no fish and we just had to put up with the Northerns if we wanted to catch any Walleyes. Jig color did make any difference and we had equal success using dark, light or bright. We happened to be using Shiners, but I think I would have preferred Rainbows, had they been available. On Lake Winnie, Walleye reports were coming in strong on Wednesday and it sounds like most groups caught fish. Jig and minnow fishing in six to 8 feet of water was the best, but some anglers were catching fish as deep as 12 feet. Acoording to a friend, the Perch fishing has also been good out there and my goal for today is to find out more about that. I'll be doing a major update about Winnie and Cutfoot for tomorrow's report. So remember to check that out before the weekend. (5/19) Bemidji Lakes Area and NMLOG Member, Paul A. Nelson says; The lakes are warming up fast and the walleyes are getting more active as surface temperatures increase. Spotail shiner minnows have been moving into the shallows getting ready to spawn, so walleyes and other gamefish species have been feeding in areas with good numbers of shiners. Jigs and minnows have been the bait of choice for most anglers, with leeches also an option for anglers who prefer to fish live bait rigs. Most of the walleyes have been in 6-12 feet of water, depending on the conditions and time of day. Anglers have been finding crappies moving into the shallows to feed. Crappies like warmer water and will move into back bays or old reed beds with direct access to deep water. Bobber rigs with a jig and minnow have been the hot bait for most anglers, although some anglers are also having success with hair jigs or jigs and plastics. The best lakes for walleyes early in the season have been Winnibigoshish, Upper Red Lake and Leech Lake. 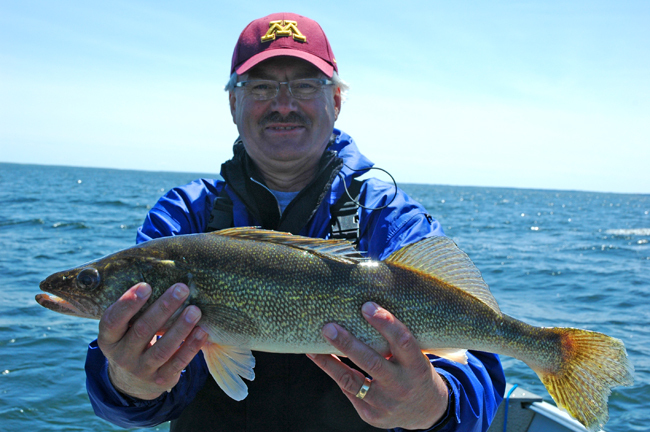 Most anglers have been finding walleyes along the shoreline break in 5-8 feet of water. Walleye fishing in the deeper lakes like Bemidji, Cass and Pike’s Bay should be picking up in the near future. Many lakes have a good number of walleyes that spawn in the lakes instead of the rivers, so they are behind in the recovery process. Most walleyes anglers have been catching early in the season have been male walleyes. More female walleyes should be starting to recover from spawning as the season progresses. Once the female walleyes have recovered from the spawn, they will begin to show up in the shallows hungry and ready to feed. Fishing Report May 18, 2011 Jeff Sundin On Tuesday, I returned to Upper Red Lake with another group of customers hoping to re-live my experience of Monday on the big lake. When we arrived in Washkish, traffic at the landing was even lighter than it had been on Monday. Light traffic remained the theme on the lake for the rest of the day too. Water temperatures at the surface were 54 degrees and would eventually reach into the 59 degree range by the end of our trip. We started fishing on the North side again, trying some of the same areas that I'd fished on Monday. The sun was shining brightly and the lake was smooth as glass. This time, there were fish present, but in numbers fewer than I found on Monday. I started fishing the shallow breakline from 5 to 6 feet of water, but the Walleyes were not on the break in large numbers. This time they were a little deeper than the previous day and I wound up finding better numbers in 6-1/2 to 7 feet. Isolated rocks and weed patches were still the best producers. Today, most of the fish we caught were in the protected slot, so we weren't putting too many in the cooler and decided to make a move. On a whim, I stopped at the Crappie cribs at the "North Unit" just to see if anything was out there. I turned on my Humminbird's Side Imaging and quickly got some incredible images of the structures. I located a half dozen of the old cribs and as you can see by the photos, there isn't much left of them now. Most of the brush is gone and all that remains are the large logs that they used as the box, or base structure. We did bag a few Walleyes as we fished around a half dozen of the old piles, but there wasn't any sign of a school of fish and no sign at all of any Crappies, so we kept moving. On the South side of the bay, we found enough breeze to provide a chop on the water. We fished only on rock piles and found fish on all of them. The best was a small, round pile located in 7 feet of water and topped out at about 4 feet. There was a steady supply of fish moving around and we easily filled out our limits with keeper size fish and also released many more "slot fish" here too. Like Monday, there were still no whoppers and our largest fish was 20 inches. For most of the day, we used only fatheads and had plenty of action on them. Fishing Report May 17, 2011 Jeff Sundin Monday was the kind of day that makes putting up with 5 months of winter worth the trouble. Sunshine, light breeze, Walleyes biting and NO COMPETITION! With full sunshine and calm winds predicted, I and my my long time customer and friend, Bruce Champion decided to make the run up to Upper Red Lake. I knew it was going to be a good day as soon as I pulled into the town of Washkish, MN and looked at my phone. After 4 years of complaining about not being able to use my cell phone on Red Lake, ATT finally put in a tower and now I have 5 bars. So, guess who I called, nobody. But it still felt good to know I could have! When we pulled into the landing on the the river, we had more reason to be happy because the parking lot had about half of the normal number of rigs parked. Traffic on the river and on the lake at the river mouth was really light compared to recent years. 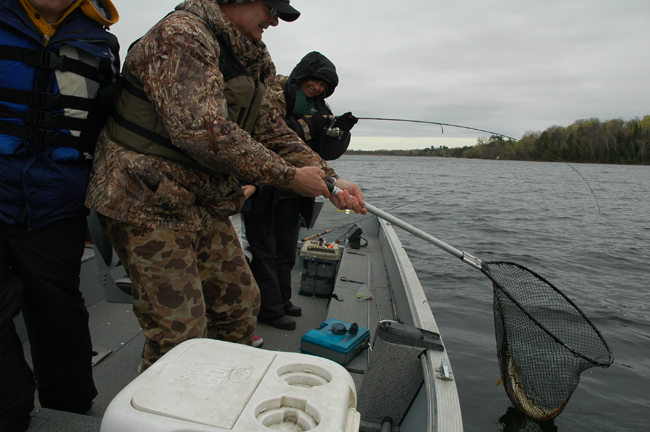 Before we ever got out to the last buoy, we were already watching one lucky angler as he battled a nice Northern Pike. When they landed the fish, I snapped a few pictures and it looked like it was at least in the high 30-inch range. On the lake, surface water temperature was about 53 degrees. I decided to move up to the North shore to take advantage of the faster warming from the bright sunshine. Initially, we fished on the breakline between the shallow sand flats and about six feet of water. There were Walleyes scattered all along the breakline, but when I started keying in on small rock piles, the action really picked up. 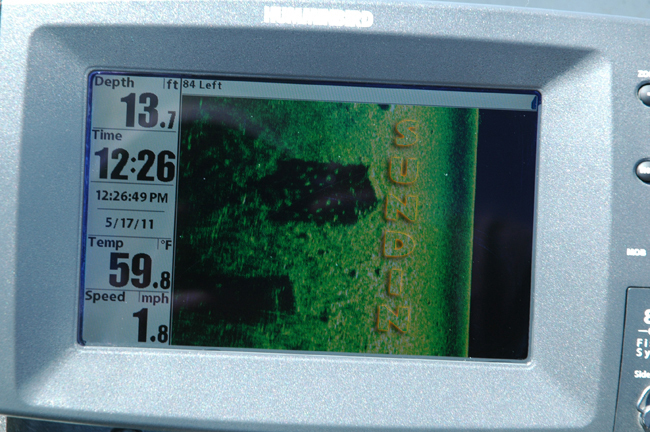 If you've been curious about good reasons to use Humminbird's Side Imaging, this is one of them. We just cruised the breakline and watched for isolated piles of rock and whenever I spotted one, I'd just mark it on the GPS, then stop and fish it. Almost always, there were at least some fish on the rocks. Some spots were better than others, but there were fish everywhere we stopped and by the time we wrapped up, we had boated well in excess of 50 Walleyes and sorted out our limit of 8 keepers. Most of the fish we caught were males, so there were no trophies. Our largest fish was 20 inches, smallest was 14 inches. We boated one nice Pike in the high 30 inch range too. These recently spawned out females are skinny right now and don't look as impressive as they would in a few months of even by mid June, once they've had time to recover. (5/17) From Sportsman's Lodge in Baudette, Jacki said "We fished with 1/8 ounce jigs tipped with fatheads, rainbows and a few shiners that we left over from Sunday. I also caught a number of fish iwith the 3 inch Ripple Shads and I think we could have spent the whole day just fishing with those if we'd wanted to. 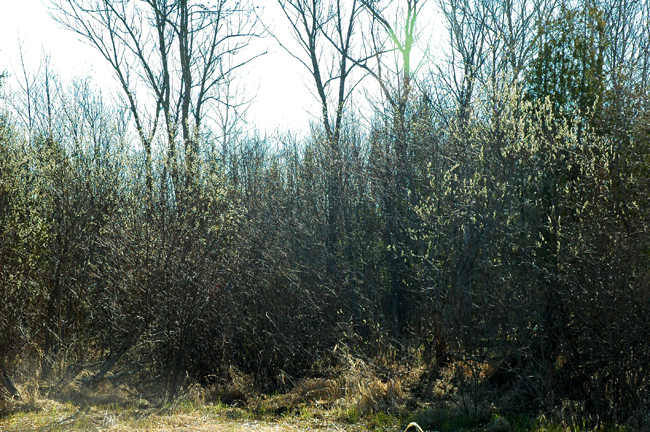 "We wrestled with the wind over opener but that didn't keep the walleyes from biting. A limit was not hard to come by. Anglers found walleyes up the Rainy River about 4 miles from Wheeler's Point jigging with a minnow in about 14' of water. A few other spots anglers were successful were in Lighthouse Gap and Morris Point washout." (5/17) According to Mike at Border View Lodge in Baudette, "Most anglers bagged limits of walleyes. The river seemed to be holding mostly smaller males, while the lake and four-mile bay had a mix of males and females. Mornings and evenings have been the best." "Jigs in 12 to 22 feet have been working well. Drifting with spinners in 8 to 12 feet has also been producing nice walleyes. There have been some good reports from boats pulling plugs in as little as 4 feet of water along Pine Island and in four-mile bay." (5/17) The folks from Stony Point Resort on Cass Lake reported that water temperatures remain cold on Cass. Surface temperatures on Sunday were at 48 degrees. In spite of the cold temps, anglers are finding some fish though. Best bet for Walleye action has been 10 feet of water with jig and minnow. 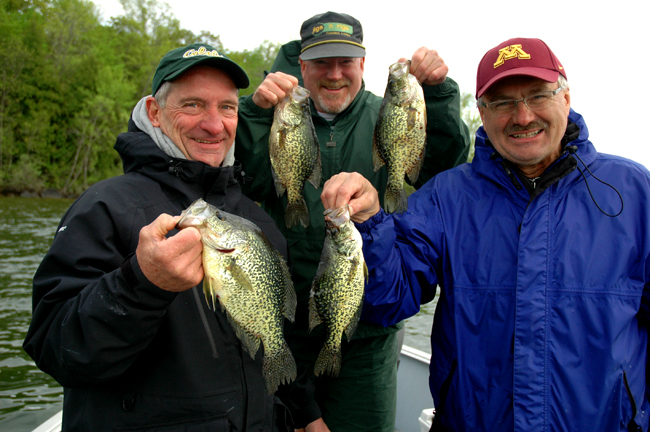 (5/17) From Gus' Place Resort on Ball Club Lake, Gus says that surface water temperatures range from 48 to 52 degrees and according to his log from the 2010 fishing season, Crappies began moving on May 16th. With sunshine and calm winds on the way, panfish should be heading toward the shallow weeds any time. Over the weekend, blustery East winds held off some of the traffic, but anglers who were out there caught Walleyes using slip bobbers tipped with live minnows or jumbo Leeches. The best depth range was 8 to 12 feet. Northern Pike and Perch were caught on the South end of the lake by anglers fishing the breakline adjacent to deeper water. Learn more about Ball Club Lake by visiting Gus' Place Resort. Fishing Report May 16, 2011 Jeff Sundin I'm not sure how we could have written a script for a better day than we had on Sunday! High blue skies and full sunshine from start to finish moved the surface water temperatures on Cutfoot Sioux from 47 degrees in the morning, to just above 52 degrees by late afternoon. With more sunshine and calm winds on the way, look for Crappies to move back into the shallow bays and channels today and tomorrow. It's still early for them to begin spawning, but the pre-spawn feeding binges will start and stop until the surface temperatures begin holding at just above 60 degrees. (5/16) I spent my day on Cutfoot Sioux yesterday. Reports about the action on Saturday were fantastic! Stories like anglers filling their limits during the first hour of fishing were common and I didn't hear of anyone who was disappointed. On Sunday, the action had slowed down, but was still good considering the sudden change from grey skies and windy conditions, to complete sunshine and fairly calm conditions. Fishing was spotty for us, but we did locate a couple of decent schools of fish to work on. I'll bet that minnows are gathering on the large, shallow flats and Walleyes are hanging close to the food source. The best fishing areas were along breaklines adjacent to the largest, shallowest flats. 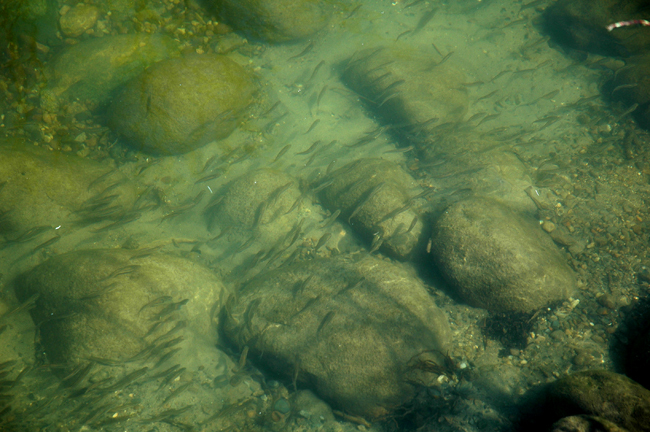 The bigger the area of shallow water, the better the fish seemed to like them. The best depth for us was 8 to 9 feet. We were fishing with 1/8 ounce jigs tipped with a mixture of Shiners and Rainbows. It appeared that larger size minnow were producing fish better than smaller ones and we didn't notice any real advatage using one type of minnow over another. Pitching the jigs out and away from the boat was helpful though, especially when we pitched toward the shallower water. By the end of the day we had managed to catch 21 "keeper size" fish and another dozen or so that were in the protected 17 to 26 inch slot. We caught fish throughout the day and I'd call the action steady, but it was never an all out action bite. Fishing Report May 15, 2011 Jeff Sundin Minnesota's Fishing Opener was a good one in the Northland and for once, it sounds like the weather was better up here than it was further south. We had a cool wind and a few sprinkles, but compared to some, the weather was fairly good. (5/15) Governor's Opener on Pokegama I'm anxious to tell you about my experience on Saturday morning at the event. For me, the opener was great! Not because we caught tons of fish, but because I lucked into a great work assignment and wound up landing a new fishing buddy, hopefully for life. During preperations for the event, everyone gave me a heads up about Hunter Landwehr, the eleven year old son of the Minnesota DNR Commissioner, Tom Landwehr. The comments usually went something like "this kid is ready to fish, so be prepared" or "be ready to answer a ton of questions" and so on... You know, kind of like they were saying "hey Sundin, be on your toes out there and don't mess this up". So, I was feeling a little pressure. Well, the experience turned out to be the complete opposite! There's no way that anyone could have been any warmer or easier to be with than the Landwehr family. Tom, Patty, Roslyn and Hunter all treated me like we'd known each other for years and the time literally flew by! We caught a few fish, swapped stories and worked on our fishing strategy right up until the last second. Then, in what seemed like only a few minutes, the whole morning had passed by and the event was over, but not finished. I promised Hunter that we'd hook up again on a day when we could go out and have "a real fishing trip". I always keep my promises, so Hunter, I hope you take me up on that! About the fishing, one highlight of our experience was the moment that with all eyes on him, Hunter landed a nice Northern Pike. He said it was his biggest one so far. We were hoping to follow up on a hot tip about good Crappie fishing that had occured a couple of days earlier. Since we were off to a good start, we decided to make a move and head for shallow water. We found the spot, along with several other anglers fishing from shore and rigged up with smaller jigs, bobbers and crappie minnows. Small Perch pestered us for a while, then a couple of Largemouth Bass and then a handful of Sunfish, everything except a Crappie. Apparently, the cold snap was enough to move them back out into deeper water and we'll have to wait a day or two to try again. In the end, we wound up heading back out into the 25 to 30 foot range and rigged up with heavier jigs and minnows. That worked better and we picked up a few more Pike before we had to leave. (5/15) Ryan Klein, Ryan's Guide Service checked in this morning with a report fro Upper Red Lake where he fished on Saturday. Ryan said that they fished in 6 to 8 feet of water on gravel. Their approach was jigging to find fish and then bobber fishing to stay in the school. Overall, their action wasn't bad and they reported catching about 30 fish and sorting through enough slot-fish to get their dozen keepers. Ryan said that acoording to game wardens on the lake, action was slower than recent years, but that fish were being caught. He added that the landing at Washkish was busy and he estimated 150 plus rigs at the main lot. (5/15) A couple of friends stopped by the house on Saturday and told me that fishing in Cutfoot Sioux, they'd caught their limit of Walleyes before 11:00 AM on the opener. When asked where, they said "in the water". In other words, if you can find 'em, they're biting. (5/15) On Lake Winnie, Joe Thompson from Four Seasons Resort said that the Northeast wind kept folks from moving around on the West side of the lake, but even with limitied mobility, Walleyes were caught. Their boat came in with a dozen keepers and he said that they released several slot fish as well as some smaller fish. Overall, the action was steady, but not fast. (5/15) On Leech Lake, Portage Bay area fishing reports were good, but not great. Some fishermen were catching limits, but not everyone. The ratio of keepers to slot fish sounded like about 50/50. There were a number of anglers reporting good catches of Perch and also a fair number of above average size Northern Pike. 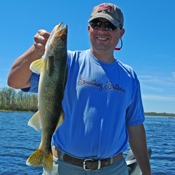 Fishing Report May 14, 2011 Jeff Sundin Minnesota's Walleye Fishing Opener is finally here. The weather is going to remind us of winter, but the point is getting out on the water and wetting a line, if we catch a few fish, well that's an extra gift. I found out yesterday that I'll be fishing with a family who just plain likes to catch fish, no matter what kind. So for this morning, I may not even try to catch a Walleye. Instead, we're going to follow up on reports from several friends who think that they can help us find Crappies on Pokegama. If it works out, that would make my day and I'll have 3-1/2 hours tyhis morning to try and make it happen. If you're in the area and want to see how everyone does, check in with us at the Grand Rapids Community Shore Lunch at Zorbaz on Hwy 169 South. The festivities begin at 11:30 AM and it's open to everyone! Tomorrow starts off the "Real Fishing Report" season, check in every day and be sure to let us know how you're doing out there too! Good Luck Today! Fishing Report May 13, 2011 Jeff Sundin Friday the 13th, wow, lucky we don't have to fish until tomorrow! The countdown is over and the big day is almost here. On Saturday morning, over a half million people will wet a line in Minnesota and no matter whether the fish cooperate or not, Minnesota's fishing heritage will continue for another season. Most important though, is that for the really lucky fishermen like me, who get to fish with kids this weekend, we'll get the special privlidge of helping pass the tradition on to another generation of eager young anglers. Last night at the meeting of all of the Governor's Fishing Opener "Fishing Hosts", they announced the names of the "Top Five" Host Anglers for the event. Scott Glorvigen, Jeff Sundin, Tony Jerrule, Dale Anderson and Gordon Fothergill will make up the team who will be fishing with the top 5 VIP's for the opening day event. As members of this team, we've been given the opportunity to "lead the way" in Grand Rapid's endeavor to put our best foot forward as a fishing and tourism destination. Obviously fishing will be an important part of the weekend, but there are also several public events that anyone can attend. I, along with many of the other hosts, visiting media anglers and VIP's will be at all of the events, so it's a great chance to meet up one last time before we all get busy with the fishing season. Today Fri. May 13th Governor's Fishing Opener Community Picnic, 4-7p at the IRA Civic Center. Kick off event to the Governor's Fishing Opener weekend. This is a public picnic and there's no charge for the meal. They have enough free food for the first 4000 people who show up. There are kids & family activities as well as live media remotes. On Saturday at 11:30, at Zorbaz on Hwy 169, there will be a community "Shore Lunch". You can swing in to check up on our luck from the morning fishing trip. For me, the weekend is going to be hectic, but fun. My assignment is to entertain the Commissioner of the Minnesota DNR, Tom Landwehr and his family. It's going to be a full boat, so I'll even need to lend out my extra special, reserved seat for the occasion. We'll be sticking around somewhere on Pokegama for the morning and in spite of the blustery forecast, we'll be smiling up a storm out there. If you spot us, be sure to say hi. (5/12) On Tuesday, I heard from Ron at Taber's Bait in Bemidji. He said that he has a "good supply of beautiful leeches, ranging in size from small to jumbos." His report about the Spot-Tail Shiners is less optimistic. He does have some on hand right now, but still not close to what he'll need to supply all of the anglers who will stop in this weekend. So far, high water and fast current has prevented them from getting any of the "Creek Minnows" like Redtails, Creek Chubs or Dace. His supply of Rainbow Chubs is good though and for me, when push comes to shove, I'd just load up on those for the weekend. The Rainbows are hearty, the Walleyes love them and it's the perfect minnow for swimming on a light, 1/16 ounce jig in the shallow water. Terry Scmitz at Frontier Sports in Marcell, says that like everyone, they're not getting the Shiners that they want. But other minnows like Rainbows and Fatheads are in decent supply for the weekend. Leeches and Night Crawlers are stocked and Terry is hopefull that we'll get a sunny day or two before the opener. I got an update from Bill Powell at Fred's Bait in Deer River and he's in about the best shape of anyone so far. He said that he'd probably have to limit Shiner sales to pint quanities for this weekend, but at least he's got a supply on hand. Like the rest of the bait dealers, Bill says that one sunny afternoon is all they need for a Shiner run and with 3 days of trapping to go before the opener, he's still hoping to hit the mother lode before the weekend. (5/12) Bemidji Lakes Area and NMLOG Member, Paul A. Nelson says; The walleye season opens this Saturday, May 14th at 12:01 am. The season also opens for northern pike and stream trout living in lakes. The seasons for bass and muskies remain closed, to give them more time to finish spawning. Water temperatures in most lakes in the Bemidji area will be less than 50 degrees when walleye season opens on Saturday. The most active walleyes on the opener should be the river spawning male walleyes that have been done spawning for the longest period of time. Many anglers like to fish the smaller lakes on a chain of lakes on the opener. 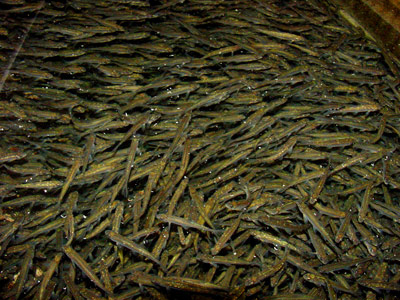 Migrating river spawning male walleyes should be feeding their way back to their home lakes, while the female walleyes head for deep water to rest after the spawn. The key areas for walleyes on opening weekend should be points, large shoreline connected food shelves and bottle necks between lakes that are along the migration routes of walleyes returning to their home lakes. 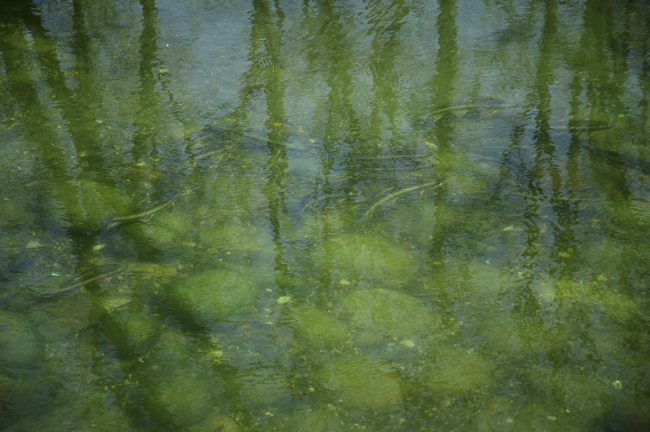 Rocks and broken cabbage weed beds offer baitfish and minnows some of the only cover they have early in the season. Most anglers will use jigs and minnows and start in 6 to14 feet of water until they find a productive pattern. Shiner minnows are usually the most popular bait for walleyes early in the season, but cold water temperatures and restrictions on transporting bait may make shiners tough to get on the opener. Anglers may have more luck finding larger fathead minnows or rainbow chubs, which will also work for walleyes. Anglers may also want to bring a bobber rod along on the opener, in case they run into a school of feeding crappies while fishing for walleyes. Crappies have been moving into the shallows to feed in many lakes recently, so they give anglers another option if walleye fishing is slow. (5/12) Transporting Minnows Here's a question about transporting water that came in by email. I put it here because the question and answer are important to anyone, going anywhere near water this weekend. Q) Jeff, I can't think of a better guy to ask. If I have a bunch of minnows left at the end of the day, is there anyway to legally transport them home for the next day? I do have a Frabill aerated bucket, can I take them out of the boat and transport them in this, and if so do I need other than lake water. I'm sure the price is going to be sky high, and it would surely help if I could bring them home. Part two, If I trap my own (minnows) in a nearby creek, can I transport them home in the creek water? A) Part one; All you have to do is deep a supply of fresh water in the truck and put the minnows into that befoire you head home. All of the boats baitwells, livewells and bilge need to be drained. But so far, portable containers like coolers or portable buckets with bubblers and fresh water are still allowed. Part two, Legally, you're supposed to take the minnows out of the creek water and put them in fresh water to transport. Now, there is the law, and then there is the "spirit of the law". If you took the minnows home and then changed out all of the water before you took the minnows to another lake, the net effect is the same as keeping them in fresh water the whole time. The problem is that the law reads that you cannot transport "THE WATER", not the bait. I'd hate to see you get a ticket, so it's a lot better to set yourself up a big cooler for transporting your trapped bait. It's easy to do. You can keep a lot of minnows alive and it doesn't cost a fortune to set up a bait tank, here's a link to how I have my fresh water bait system set up. Fishing Report May 11, 2011 Jeff Sundin They say that today, we'll see a rare, cameo appearance of something known as the sun. I know it still exists because I saw it one day last week when I left the area and drove south for a few hours. On Tuesday evening, there was a patch of blue sky struggling to get free and I managed to snap one picture of the closest thing to blue sky we've seen around here lately. Who would love to see this even more than I? The bait dealers who are hearing their phones ring off the hook with questions about the bait supply for the up-coming weekend. On Tuesday, I heard from Ron at Taber's Bait in Bemidji. He said that he has a "good supply of beautiful leeches, ranging in size from small to jumbos." His report about the Spot-Tail Shiners is less optimistic. He does have some on hand right now, but still not close to what he'll need to supply all of the anglers who will stop in this weekend. So far, high water and fast current has prevented them from getting any of the "Creek Minnows" like Redtails, Creek Chubs or Dace. His supply of Rainbow Chubs is good though and for me, when push comes to shove, I'd just load up on those for the weekend. The Rainbows are hearty, the Walleyes love them and it's the perfect minnow for swimming on a light, 1/16 ounce jig in the shallow water. Fishing Report May 10, 2011 Jeff Sundin We're getting down to the wire now and bait dealers in the Itasca area continue to wring their hands about the slow start to the shiner run. Weather conditions appear to be ready to improve today, but in addition to the predicted warming trend, we're going to need some sunshine to help jump-start the process. As of Monday, the majority of the local bait shops are still looking for a supply of Spot Tails for the weekend. The minnow trappers have begun seeing a few trickle into their traps, so there will be some. But for now, it looks like there will be an opportunity for us to prove our versatility this weekend by catching fish on other types of baits too. For me, rainbows or some nice size fatheads will be fine. With warm temperatures predicted, we may also have some good luck with artificials this weekend. I'll be experimenting with that, especially on Saturday. 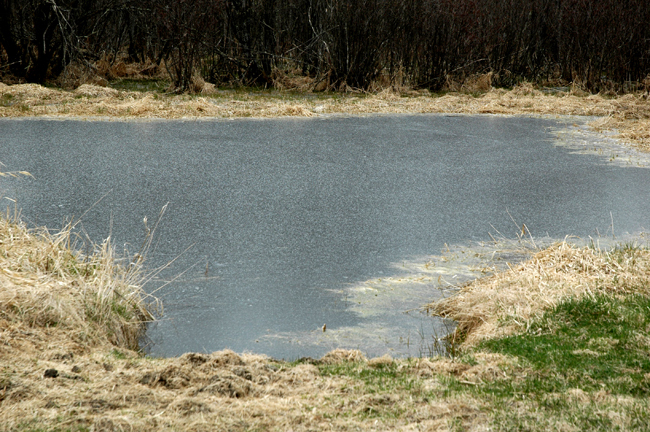 Fishing Report May 9, 2011 Jeff Sundin Conditions around Deer River are fairly stable and working in favor of anglers for the up-coming opener. There's a little rain in the forecast, but it looks like showers or light rain is about all we have to prepare for. It felt odd for me not to be fishing on Mothers Day. More often than not, the holiday coincides with the fishing opener and for a long while, I've used it as an excuse to get my mother in the boat and take her fishing. I thought that I'd cooked up a plan to make that happen on the Wisconsin side of the river this weekend, but my idea got the cold shoulder. In spite of not making the fishing trip, I felt a little bit better by managing to scrounge through the freezer until I found enough fish to have the traditional Mothers Day Fish Fry on Sunday evening. (5/9) On Sunday, the news about minnows got better, when I learned that Bill Powell had secured enough Spottails to get him through opening weekend. I'm not sure if he actually trapped them or found somewhere to buy them, but it's good news either way and it means that there is at least some minnows running, somewhere. (5/9) Amidst all the gloom and doom about the cold water and lack of panfishing action, I keep getting these reports from Greg Clusiau about how he's catching Crappies. What? Is he the only one in the area who knows how to find 'em? He was out again over the weekend and managed to bag another batch. Greg said that the water temperature was just over 52 degrees and that the male fish were starting to show their black spawning colors. There should be more movent during the week and I'd expect to hear more about Crappies soon. 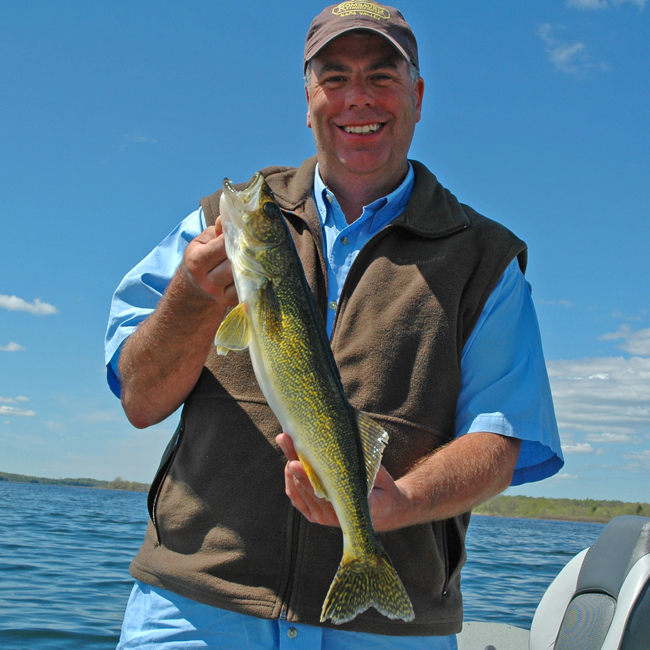 (5/9) Mike Kinsella from Border View Lodge on Lake of the woods says that Walleyes are just about completely done spawning and he's looking forward to a strong opener. The Sturgeon fishing season has now reverted back to catch and release only. Mike says that anglers are still catching some fish, but the action has slowed down. According to the DNR, Sturgeon spawning activity is winding down too and action for larger fish will remain slower until after they've had a chance to recover. Northern Pike are still being found in the shallow bays and small river tributaries to Lake of the Woods. Mike says that there have been a number of Pike in the 40 inch plus range being reported. Anglers arriving early for the Walleye opener, may still have a day or two for catching Pike before they start moving out of the shallows and back into the main lake. Fishing Report May 8, 2011 Jeff Sundin Happy Mothers Day Mom! Happy Mothers Day to everyone! The weather has been trying to cooperate a little, but cold water temperatures are keeping the fish away from most of the shoreline areas so far. The handful of local Crappie fishermen that passed through Fred's Bait on Saturday reported finding small packs of fish roaming in deep water. Vern Valliant reported catching a few of these deeper fish, but he added that fish were very in-active. He said that water temperature on the surface was 56 degrees and exploring know Crappie haunts in shallow water yielded no sign of fish. Bill Powell was out checking for Shiners in his traps yesterday and when I touched base with him in the early evening, he reported catching only a "small handful" of Shiners. So far, they do not have any Shiners in the tank at the store. On Saturday, I heard a lot of speculating on the radio about the impact of cold water on the fishing opener. Just keep in mind, there are just as many ways that cold water temps can work for you as against you. I'll expand on that for tomorrow. Fishing Report May 7, 2011 Jeff Sundin It might not be fishing, but a little time on the water really felt great over the past couple of days. We ran and photographed some really great boats, the weather was fantastic and I got the extra special treat of working with my daughter Katie. That's right, she's the gorgeous model I was talking about yesterday! The weather was perfect while we were there, so we got to do more work than usual. In fact, Katie even got her own "solo shot" running one of the sixty some models in Lund's 2012 model lineup. Lund has a great crew and a fantastic photographer who pulls all of these shots together perfectly. Now we'll have to wait until fall to see the finished product, but I think it's going to be worth the wait. (5/7) Back to fishing. The first news I got when upon returning home is that the bait trappers are having some real trouble finding minnows so far this spring. In spite of the warm sunshine over the past couple of days, the Spot Tail Shiners have not started moving into the shallows. According to minnow trapper and owner of Fred's Bait, Bill Powell, ordinarily the first couple of days after ice out there's a couple of warm days that trigger a "feeding run" for the shiners. After that, it's normal to have a slow period before the minnows return to the shallows to spawn. The problem this year is that ice out arrived at the same time cold weather and high winds pounded on the shoreline. That early run never happened and now we're in the middle of the "waiting period", hoping that the minnows will show up soon, really soon. Bill says that he's having some luck finding Rainbows and Fatheads, but his harvest of these minnows is also running at 50% of what it should be. On Friday, it warmed up a little and he said that there was "a trickle" of minnows coming into the traps. For now, it looks like the supply will be light for the opening weekend. Fishing Report May 6, 2011 Jeff Sundin On Thrsday afternoon I arrived at the top secret location of the Lund Boats photo shoot and had an assigment almost immediately. I have to say that it helps make it easier to get your picture taken when you're paired up with a gorgeous model who loves to fish! So it looks like we have one photo for the magazine for sure. We start shooting again this morning at 6:00 AM, so, I'm signing off for now, but try to update sometime after 10 AM. (5/5) The Wired2Fish archives section is where all of you early season panfish anglers can find an interesting video about a great ne item that will help you hold your boat still in the prime, shallow water spawning areas. Check out Minn Kota's Talon, shallow water anchoring system. View this video and learn more. Water temperatures are creeping up as the spring air finally gets serious about moving in. Over night we started getting a few rain showers, but even at 4:30 AM, the air temperature was hovering at 50 degrees. Even if it doesn't get much better than this, it will be good news for the Minnesota Fishing Opener which is now only 9 days away. Thanks to the warmer weather, on Wednesday, I managed to get an early start in the spray booth and now have about 10,000 jigs almost ready for their final coat. I've still got another 20,000 ahead of me to finish, but by early next week, we'll be scurrying around getting them all delivered. In terms of weather, Wednesday was another good afternoon for the smart Crappie fishermen in the area. My friend Greg Clusiau proved it by fishing a small lake from the bank where he found a surface temperature of 52 degrees. Sneaking around the shoreline, Greg managed to sneak up on a school of nice Crappies. He said that his intial offering of small minnows were completely ignored by the fish. He switched to a small, ice ant type jig and tipped it with a small piece of cut night crawler and this presentation got their attention. (5/5) Are you ready for the opener? I know you've probably thought of most everything already. But just in case you missed something, Wired2Fish has a great article on getting your boat ready for the fishing season. Check out the Springtime Boat Checklist here. Fishing Report May 4, 2011 Jeff Sundin All I Can Tell Ya' is that it really stinks when the perfect day comes along. Especially when the day that would be perfect to get outside and "go play" is also the perfect day to stay home and work. I had to though, with all of the cold weather, painting jigs has been really tough and yesterday's warm afternoon was perfect for going into high production mode. At least I got to live my fishing trip vicariously through my friend, NMLOG member Sean Colter, who managed to get his kids out on the water late yesterday afternoon. The panfish, Crappies and Sunfish didn't make it into the shallows, but Sean did find the fish out in deeper water. The 18 to 24 foot depth range was where the fish were holding. Sean had already tried minnows and some plastic baits too, but the fish had lockjaw until they switched into ice fishing using tiny jigs tipped with waxworms. The outlook for today could be good again, high temperature in the 60's, more sunshine and light winds. It's a great excuse to drop your boat in the water and if you poke around for a while, you might find a school of panfish yourself. The lakes are open and the weather is finally starting to feel more like spring. Many of the walleyes spawning in the rivers connected to the lakes in the Bemidji area have finished spawning, while walleyes spawning in the lakes are just starting to spawn. 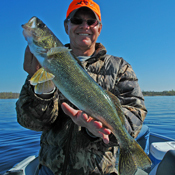 (5/4) Bemidji Lakes Area and NMLOG Member, Paul A. Nelson says; "The walleye opener is scheduled for May 14, 2011. Anglers will likely see cold water temperatures on the opener, even if there is a significant warm-up between now and the opener. Anglers should find the most active walleyes on lakes where many of the walleyes spawn in rivers, so they have had more time to recover from the spawn. In chains of lakes, many of the male walleyes will still be feeding their way back to their home lakes when the fishing season opens. Most anglers use a jig and shiner minnow early in the season for walleyes. The best depths should be less than 10 feet in most lakes, with the old cabbage weed flats and any shallow rocks providing the only cover available at this time of year for baitfish and minnows. Crappie and sunfish action is starting to pick up on some lakes, but many of the fish are still holding in deeper water adjacent to the shallows, waiting for some warmer weather before moving shallow to feed. 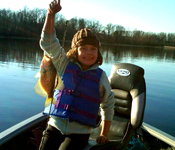 Anglers are reminded that the new 2011 Minnesota Fishing Licenses are now in effect. Walleye anglers are encouraged to purchase a walleye stamp with their fishing license, to help provide designated funds used for stocking more walleyes in Minnesota lakes. The public docks are going in this week at most of the public accesses, so anglers will be able to put their boats in the water and give everything a test run before the real fishing begins in a little more than one week." Finally, as wrapped up as we are around here, with the Minnesota Fishing Opener, don't forget that if you really want to wet a line soon, The Wisconsin Fishing Opener is this weekend, Saturday May 7th, 2011. Yes, that means that if you want to, you can go Walleye fishing in just 5 days! In addition to Wisconsin's inland lakes, border rivers like the St. Croix River and portions of the Mississippi River that share the border with Wisconsin are also open territtory this weekend. Fishing Report May 3, 2011 Jeff Sundin As cold as Monday morning started out, the afternoon sun finally broke through and gave us all a reason to smile. The scene outside my office window now is even more optimistic! Clear blue sky, the first calm breeze in a week and a predicted high temperature of 60 degrees. I can already see that after I clear up a pile of morning business, I'll get bitten by the spring fever bug again late this afternoon. It's a little late for the feeding run that occurs at ice out. But considering the recent weather, this could be a good afternoon to get out and check the shallow water for some pre-spawn panfish action. Either way, I'll have something for you tomorrow that includes water! Fishing Report May 2, 2011 Jeff Sundin Wow, I'm really glad that I changed over to the summer fishing page! It's 27 degrees right now and the water in the yard is frozen. I know it's going to warm up, but It would sure be nice to get a little help. You might catch this report before I get finished with today's project, the 2011 Fishing Outlook for Lake Winnie. I'll have it on the site soon, so please check back again later in the morning. Fishing Report May 1, 2011 Jeff Sundin Welcome to MAY! It doesn't seem like we've moved very far in the right direction today. The Northwest wind is blowing about a million miles an hour and we have a little bit of snow whistling around the yard. The last thing that anyone is talking about is fishing, at least not at the moment. In spite of the rotten weather, there is an air of optimism as resorters in the stay busy getting cabins ready, putting the docks in the water and stocking up the shelves in their lodges. For me, the week ahead will be used for painting jigs, writing and then heading for the Lund Boats photo shoot on Thursday afternoon. (5/1) I did get a report in today from Border View Lodge on the Rainy River. Jim says " Sturgeon fishing was good most of the week, but it slowed down as the cold front moved through this weekend. While the numbers were down, there were still some big ones being caught. There is still one week left to keep a sturgeon between 45 and 50 inches." Post spawn Northern Pike have been showing up near the tributaries flowing into the Rainy River. Some good action has been reported along with a few fish over 40 inches. Smaller spoons seem to be working well and the fish are going after them aggressively. It looks like it should be a good opener. The cool weather we’re having and late spawn should mean lots of big walleyes in the Rainy, Four-mile bay, and along the south shore of Lake of the Woods. We’re still catching big Sturgeon here and the post-spawn Northern Pike bite has been good with some over 40 inches. I’ve attached this week’s fishing report. 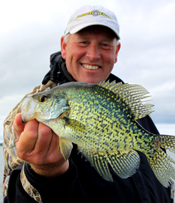 (5/1) The Wired2Fish archives section is where all of you early season panfish anglers can find an interesting video about a great ne item that will help you hold your boat still in the prime, shallow water spawning areas. Check out Minn Kota's Talon, shallow water anchoring system. View this video and learn more. (5/1) Wired2Fish Weather plays an important role in how, when and where we fish. Wired2Fish has a new video "Making Great Decisions Using the Weather". View the Wired2Fish Video Here. (5/1) I did get a report on Sunday from Border View Lodge on the Rainy River. Jim says " Sturgeon fishing was good most of the week, but it slowed down as the cold front moved through this weekend. While the numbers were down, there were still some big ones being caught. There is still one week left to keep a sturgeon between 45 and 50 inches." Bowen Lodge Feature Fishing Report 5-1-2011, Everyone at Bowen lodge is hustling this week as they get the cabins, lodge and grounds ready for the Walleye Fishing opener. The ice went out on Lake Winnie, April 26th, which is only a couple of days later than average. The DNR Walleye Egg Harvest went fast and was all wrapped up by April 27th. According the Minnesota DNR "Big Lake Specialist", Walleye and Perch populations in Winnie and Cutfoot are strong and it looks like we're heading for a grerat fishing season this summer. Follow this link to the complete 2011 Walleye Fishing Outlook from Bowen Lodge on Lake Winnie and Cutfoot Sioux. 5-1-11 Attention Lodge Owners, Rental Operators and fishing guides, it's time to update the fishing reports page! As the summer season approaches, there will be some new advertising opportunities as the winter related operators drop off the page and summer businesses start up Email your update or inquire about advertising here. Recognize this spot? Maybe it looks different now, click here for another view. 5/25/11 On Leech Lake, Crappie action was a good way to finish out the day, even if it did take us a little bit off the grid. This gorgeous Smallmouth couldn't wait for the Bass season opener! She stole my jig and minnow from a gravel patch in about 8 feet of water as we fished for Walleyes. Courtesy Craig Lenz, Tmber Wolf swimming across The Third River on Lake Winnie's North Shore. ( Click to enlarge). John Frederick with one of many Lake Winnie Walleyes he boated on Sunday. By late afternoon, everybody was smiling, especially the Early Bird. Please do your best! Remember to check your trailer and drain the water! Slow down the spread of all those nasty critters. 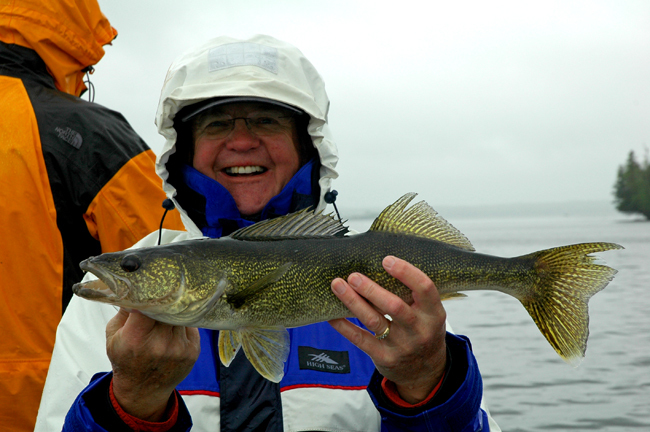 A little rain never stops Bruce Champion from smiling, especially when he's releasing nice Walleyes! Ya can't catch fish without the Hook! Don Hook shows off another Walleye. 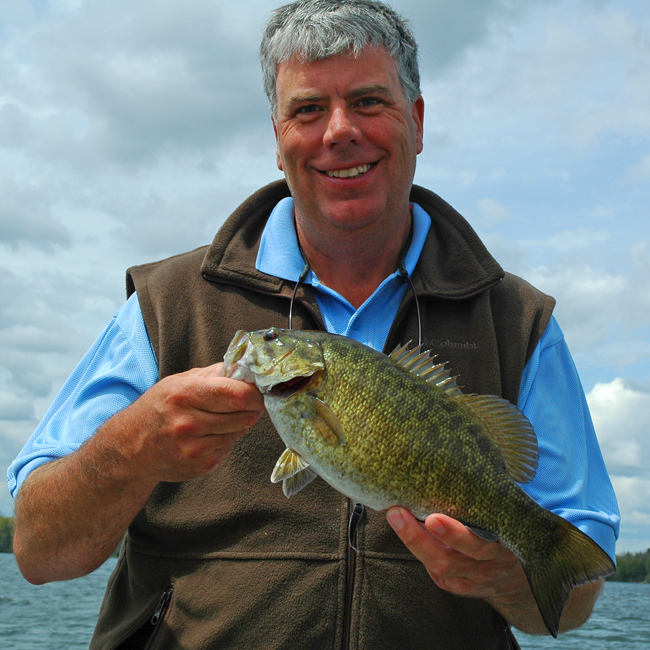 Pre-spawn Smallmouth Bass were a welcome interruption to our Walleye fishing more than once on Friday. Bass were still working the shallow edges of the breaklines. 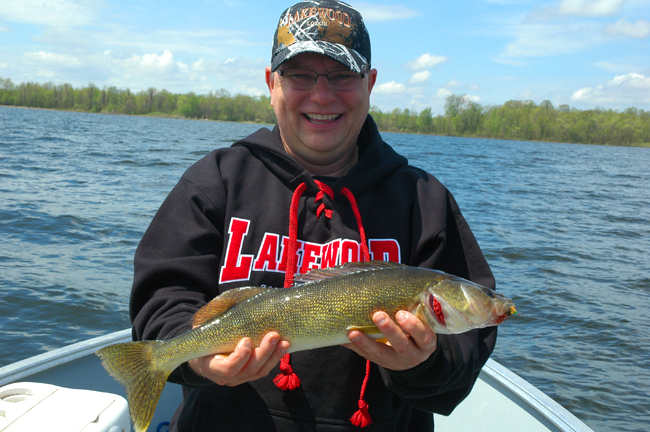 Mark Huelse with a nice Lake Winnie Walleye. Matt Scott with a hefty Bowstring Lake Walleye. Seven feet of water and weeds was the best location. My Humminbird's Side Imaging reveals Red Lake Crappie Cribs. Most of the brush is gone leaving behind just the "box" that used to hold everything together. Dale Wheeler shows off one of the better Red Lake Walleyes we caught on Tuesday. A Jig with a Ripple Shad body and you're in business! Most of our fish on Sunday were "keepers", but there were a dozen or so like this "slot fish" in the 18 to 20 inch range. 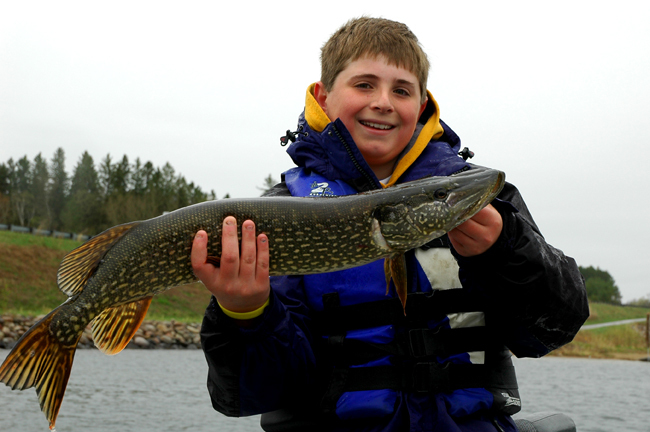 Hunter Landwehr with a nice chunky Pokegama Lake Northern Pike. Just one more fish before we head in. Planning on cooking a little shore lunch this weekend? You can get Jeff's almost secret Walleye recipe here. Shiners moving along the shoreline on Wednesday looked good to me, but bait dealers say, still not good. (below) Suckers running not too far away looked like a good excuse to fire up the smoker. Hey Walleye anglers. Unless something changes, Shiners might be in short supply this weekend. But don't worry, a bucket full of nice Rainbows will do the job nicely too! Portable, freshwater bait systems are required for transporting bait. This system works great and doesn't cost an arm and leg. Learn how to rig one yourself. As the bait dealers figure out where to get them, the Shiner Minnow supply is improving. For me, buying the stamp is a "no brainer". I hope you'll join me this season and say, go ahead and add the stamp to your 2011 MN Fishing License! 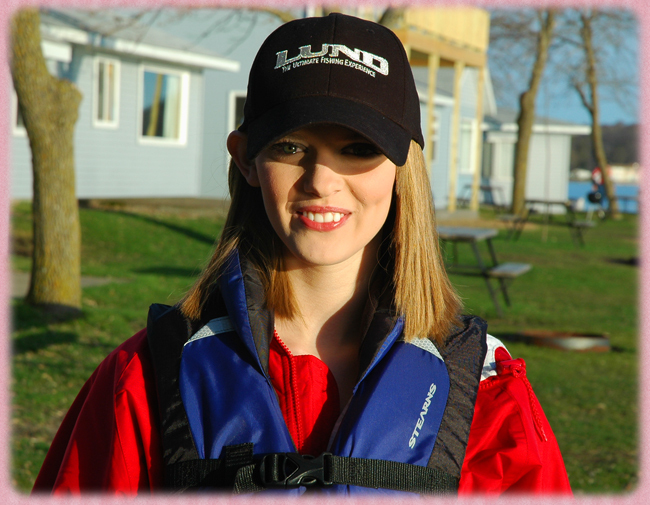 Katie Sundin at the top secret location of the Lund Boats photo shoot. Just out of wardrobe and preparing for her very own "solo running boat shot". Fishing from the bank, Greg Clusiau snuck up on a school of nice, cooperative Crappies. Water temperature on Wednesday (5-4) was 52 degrees. Jordyn Colter with a nice pre-spawn Crappie. The panfish stayed deep on Tuesday, but Sean found them in the 20 foot range. The sunshine has finally arrived and it's encouraguing buds to open. Green up is coming! Monday morning by the garden, not too promising. Monday afternoon, a whole new ball game! Remember this spot? No? Maybe it looks different now, click here to find out. For Sale 2010 Lund 20 foot Alaskan. Mercury Opti-Max, Shorelander Trailer. Help Jeff sell the boat and receive a free fishing trip! Click for details.